Quora is a site that allows people to post questions and receive multiple answers. Members of the site can post and answer questions, rate the answers, and follow other users who provide valuable content. The nature of the site actually gives you a wonderful chance to market yourself as an expert in your chosen field. How do you go about marketing yourself on Quora? What should you do? Here are a few tips. It is important to maintain a consistent online profile that is also search-engine-friendly. Remember, the more people that search for you and your content, the higher your search engine rankings will be. This in turn will boost your visibility and bring in more traffic to your site. Traffic usually translates to sales and revenue, so that’s a good thing. To that effect, take time to create a profile with all the relevant information about your business. Write a short description of what you do and provide links to your sites. You should also provide links to your social media accounts. A complete profile will enable people interested in your answers to access your sites, which may have your products for sale. Also, merge your answers and conversations with other social media platforms like Facebook and LinkedIn. This will enhance your exposure by allowing search engines to index your contributions and profiles more effectively. It’s an indirect way of marketing, but it works. There is no way you will be able to answer all the questions on Quora, because no one has the time to do it. For that reason, you need to pick your battles. The best thing to do is to determine your target audience and the kind of questions they may have or are interested in. Those are the questions that you should take time to answer. By doing so, you expose yourself to people who may become your clients or subscribers in the future. Take time to identify the leaders on the subjects that interest you. Follow these leaders and take part in the conversations they initiate. They will soon take notice of you and may keep you in mind when they have projects that require your kind of skills. You should also try to engage any followers you may have. Ask questions that encourage engagement, and answer any that your followers post. Your level of engagement with the people you follow and those who follow you matters. Try to do it several times a week or everyday if you can. Use Google Alerts to keep you up-to-date with interesting conversations on Quora. This will enhance your reputation as an expert and build your presence on the site. The more reputable you become, the bigger your audience will be as people learn to trust you. An audience that trusts you will be more amenable to any products and services you market. At the end of the day, your value on Quora will be determined by the content you produce. Ask questions that spur interesting conversations. Provide answers that are useful and clear. The answers should be complete and able to stand on their own, even if you provide a link back to your site for more information. 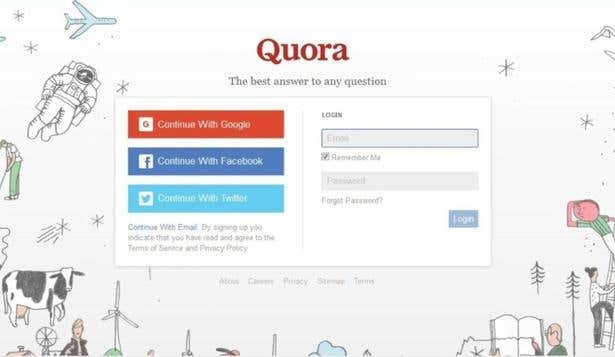 If you are looking to establish a reputation as an expert in your chosen field, Quora is the best platform for you. You can use it to market yourself for free while sharing your knowledge and learning a few things while you are at it. What more could you want?